How To Sabotage Your Winter Haircare – Nourish and Love Co. The title of this blog post should really be how to survive and thrive with natural hair when it feels like Alaska outside but that's not very catchy at all. So, let's just go with how you, YES YOU, are completely sabotaging your hair during the wintertime. Have you ever noticed that your hair might do a little switcheroo when the temperatures begin to drop? You might notice that your scalp is a littler drier, maybe more itchier than usual. So what's a curlfriend to do? Well, if you're like me you google; "Dry natural hair in wintertime" and a bazillion hits come up. I'm talking massive amounts of blogposts, tweets, pins, vlogs, and etc about how to protect your hair during the colder seasons. Plenty of information to set your hair back on the right track, right? All information is not created equal or even beneficial for your hair. Just because you may read it on a popular blog, or heard a popular vlogger say it in a Youtube video doesn't mean the information being presented is actually true, factual, or even good information. So let's cut through the junk and get to what can actually help your hair during drier seasons. It’s time to toss out the dated, unhealthy hair information. I'll show you 8 crucial ways you are KILLING your natural hair routine and 6 ways to resurrect your routine PLUS stylist recommended products to introduce into your regimen. 8 ways you are sabotaging your winter regimen. Heavier butters don’t automatically protect your hair from the cold and dry winter air. They can soften, “condition” and do their job as an emollient by providing nourishment. Just because you decide to slather on a butter doesn't mean you are doing anything beneficial for your hair. Greasing your scalp especially with products that are occlusive (physically stops water loss) will only clog your scalp and cause severe dryness. Due to this physical barrier moisture/hydration can’t escape very well, but that also means that moisture/hydration can’t penetrate this barrier. Using a lightweight penetrating oil that FEEDS your follicles and scalp is much more nutritious for your scalp. You'll thank me later. Deep conditioning is an important step in your natural hair routine. Let's say you wash your hair weekly and you deep condition with every wash. That means you will be deep conditioning four times a month. That's a great schedule so there is absolutely no need to deep condition for hours on end, overnight or for longer than 30 minutes really. That's the beauty of well formulated hair care! Even if you’re shampooing every two weeks that’s two deep conditions a month and even that is acceptable. Keep in mind that Deep Conditioning isn’t a cure-all; especially when your after-care is lacking or your products or your application habits are what’s actually drying your hair.Deep conditioning over night, for hours at a time or anything over 30 minutes is just plain ridiculous. Especially if you’re using a product formulated to work in 10 or 20 minutes, nothing else is happening after that time-frame, reclaim your time sis. Not properly shampooing to cleanse your hair leaves you open to a multitude of problems, the majority of which will lead to drier hair. Point blank period. I said what I said. Formulated specifically for your scalp and it's many needs, nothing can do what a shampoo does. See above. Think of frequently and only co-washing as putting lotion on a dirty body. There's really no point, you're just moisturizing dirt. The initial purpose of co-washing was as a refresher in between washes or when your hair just needed a bit of a hydration reset. It was never meant to be a complete substitute for shampooing. Using heavier oils on your hair after you have applied leave-in conditioners, lotions, butters, creams, or custards can leave your hair feeling weighed down and super slippery. Using oils to seal is an old but still common practice in the natural hair community and not necessary. So, out with the old and in with the new right? Here are 6 ways to better take care of your hair during this weird winter we are having. It's so simple, I promise. 1. Keep your scalp happy. Your hair is a plant! Your scalp is the birthplace of your hair, you should think of your scalp as the fertile ground that your hair grows from. So not only do you need to take care of your hair, you also need to take care of WHERE your hair is growing from. A clean scalp is a healthy scalp, free from product build-up, sebum, sweat, and dirt. Or baggy if you don't have a steamer. I will baggy and hop in the shower. BOOM DIY steamer. Steaming is a great and effective way to infuse hydration back into your hair strands. By using leave-in products that have penetrating hydration, moisture and emollients for long lasting hydration. For an extra dose of protection try out an oil-based moisturizer which does double duty for your strands. Having a set wash schedule is great but it's not great if you can't maintain all of the hydration, moisture, and conditioning that you just gave your hair. Learning how to read the labels for the best moisture retaining, hydration boosting, penetrating and conditioning ingredients is a sure fire way to know without a doubt that your hair is getting the best. During these dry, cold winters. Any other time you can get away with using a rinse-off conditioner treatment instead of a longer deep conditioning treatment. Even if you rotate, but the key is properly assessing your hair before you start your wash session to see what your hair is actually asking you for. Winter time is the perfect time for those extra thick deep conditioning hair masques as well. Another great way to love up on your strands during harsh winters is with extra treatments. Pre-poos, Rinses, Hot Oil Treatments, your hair will thank you and you'll keep dryness, breakage and brittleness to a minimum. Wool, cotton, and other coarse fabrics can cause split ends and breakage, Always line wool, acrylic, and/or cotton hats with silk or satin. Make sure you're sleeping with a satin pillowcase and scarf/bonnet as well. Now that you have some great winter hair care tips, don't you want to Rescue your Washday too? 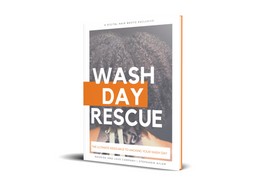 Sign up today to receive a free copy ($25 value) of the Washday Rescue ebook straight to your inbox when it is released! Want more picks from me? 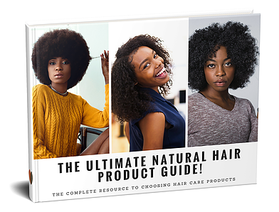 Check out The Ultimate Natural Hair Product Guide. This features 24 pages of top ranked and rated hair care products for each and every type of natural. From the Protective Natural, who always wears protective styles, to the Lazy Natural, who likes things as easy and as simple as possible! There's an option for everyone. This Guide is a must have before you go shopping for hair products again! Important: There are links on this site that can be defined as “affiliate links”. This means that I may receive a small commission (at no cost to you) if you subscribe or purchase something through the links provided that are signaled with *. I am a participant in the Amazon Services LLC Associates Program, an affiliate advertising program designed to provide a means for website owners to earn advertising fees by advertising and linking to amazon.com, audible.com, and any other website that may be affiliated with Amazon Service LLC Associates Program. If you have any questions about this feel free to contact me!